Simone Biles, 18, made gymnastics history today as she became the first woman to win three world all-around titles in a row. NBC Sports reports Biles championed over Gabby Douglas in Glasgow, Scotland at the world championship competition. She had a rocky finish, with mistakes on balance beam and during her floor routine. Still, she prevailed. 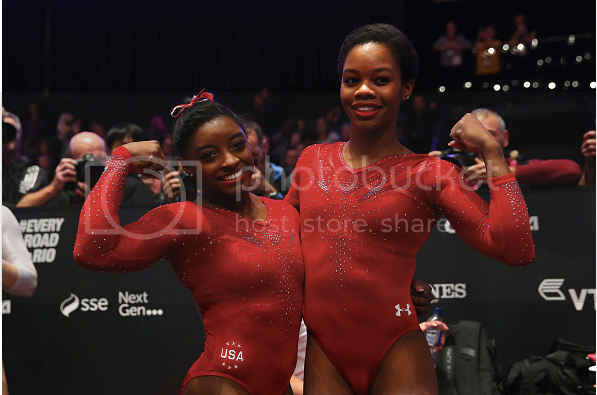 Douglas cemented her comeback and placed 2nd, 1.083 points behind Biles. Coming off of a two-year break, she's the first Olympic women's all-around champion to medal at the World all-around competition since 1981. On Thursday, Biles broke U.S. records for World all-around titles and World Championships medals with her 11th.